Looking to improve elements of their forecasting framework, NOAA has announced the winning system to power their weather forecasts. American weather forecasting is falling behind international standards. Faulty forecasts can cost lives and money. In a highly competitive test, NOAA chooses new dynamical core to upgrade their weather modeling platform. In 2012 Hurricane Sandy came ashore in New England. Most American weather models predicted it would turn away from the mainland and spend its energy over the sea. European models, however, correctly identified the threat and predicted a westward track for the storm. So what’s the big deal? Forecasts are frequently wrong, right? “If a high impact event is being forecast, emergency management personnel need to issue alerts in a timely fashion and begin mobilizing resources to deal with the aftermath,” says Rusty Benson of the National Oceanic and Atmospheric Administration (NOAA). In the case of Hurricane Sandy, the aftermath amounted to 233 lives lost, and $75 billion worth of property damage. Stung by the missed forecast, NOAA looked to upgrade many elements of their modeling framework, and convened a dynamical core testing group (DTG). This panel of experts evaluated the suitability and readiness of competing dynamical cores, a key component of the forecast system. “With our current operational dynamical core, it is difficult to represent the movement of clouds, snow, hail and wind at fine scales in an efficient or accurate manner, nor can it be easily upgraded to support the resolutions necessary to capture these aspects of weather systems,” says Benson. Testing and developing competing cores calls for strong computational power, so candidates allocated time on Edison at the National Energy Research Scientific Computing Center (NERSC), Stampede at the Texas Advanced Computing Center (TACC), and Pleiades at NASA. Candidates submitted their completed models, and in spring of 2015, NOAA began tests on Edison comparing performance and scalability of the dynamical cores. The performance benchmark measured the number of computer processors required to simulate two hours of weather in 21.25 seconds. The scalability metric considered a model’s efficiency as complexity was added to input data. Of the six original entrants, the choice was narrowed to two: The Model for Prediction Across Scales (MPAS) developed by the National Center for Atmospheric Research (NCAR), and the Finite-Volume on a Cubed-Sphere (FV3), from NOAA’s Geophysical Fluid Dynamics Laboratory (GFDL). 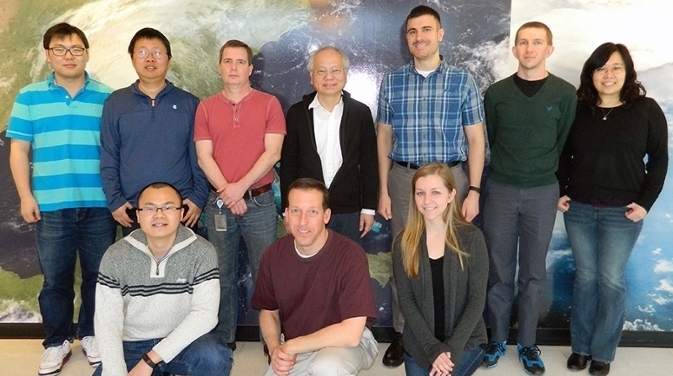 In April 2016, NOAA looked to the Cori system at NERSC to break the tie. The second evaluation undertaken by the DTG looked at ten different criteria. Perhaps most important was isolating and gauging the impact of each dynamical core by using identical physics, Global Forecasting System (GFS) physics, and initial conditions. FV3 will enable American forecasters to model several weather events at different scales simultaneously, with scales projected as fine as one km. The new model should allow meteorologists to predict weather more accurately beyond eight days. 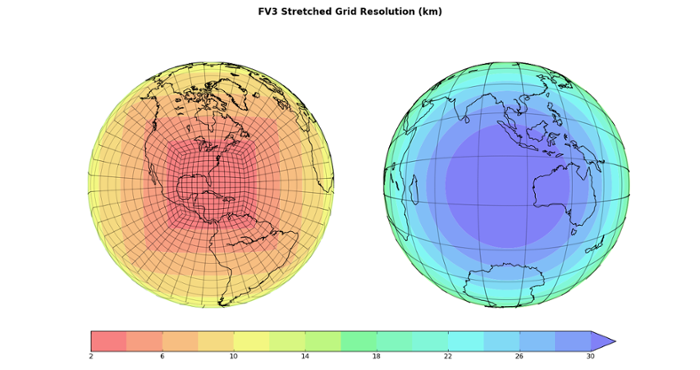 NOAA expects FV3 to run at fine enough resolutions that it can represent individual clouds and yet still be efficient enough for global weather simulations. NOAA also expects a significant improvement in forecasting hurricane track and intensity and expects to predict extreme weather events like Hurricane Sandy up to a month in advance.